Masseria Agnello on Sicily’s west coast, is quite simply a very special property. 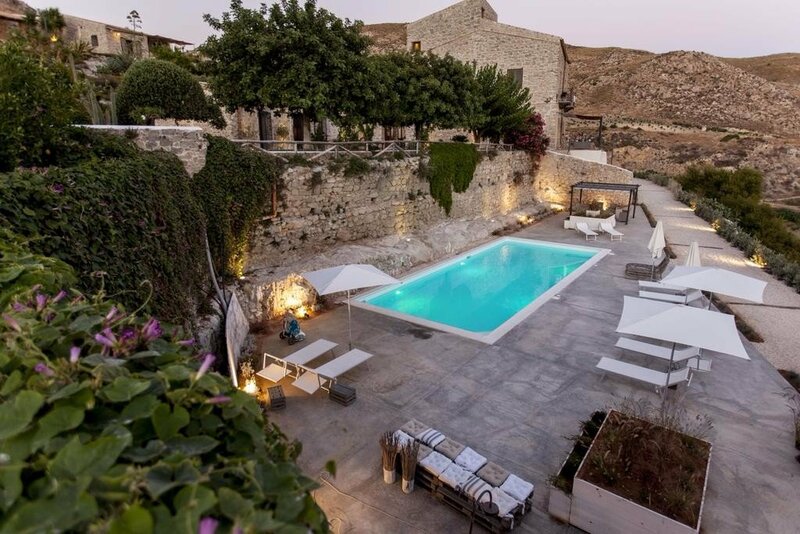 The grand stone building is the first thing that strikes you, an aristocratic farmhouse villa from the 19th century, it is stately and imposing from the outside, and on the inside very tastefully styled and furnished, with its modern touches at ease on the traditional Sicilian farmhouse canvas. The grounds are something of a fertile oasis too, with the green lawns, lush palms, carob, citrus and olive groves a striking sight against the barren hills that surround. The have a range of rooms and suites to sleep up to four people, some of which have their own terrace and all of which are spacious, clean and super comfortable. There is a curated mix of old and new in terms of furniture and decor, but the rooms, and the whole building in fact, retain the charm and atmosphere of a bygone era. You can expect luxury hotel standards at Agnello and all the rooms come with flat screen TV, WiFi, mini bar etc., plus some very plush en suite bathrooms. The grounds have a series of very attractive gardens with various flowers and aromatic plants and herbs, like rosemary, lavender and thyme. There is an outdoor swimming pool too and the views from all around the property are stunning, especially towards Realmonte and the sea beyond. There is a fine restaurant at the Masseria, where you will be treated to an excellent breakfast, and where you can sample some great local food for lunch and dinner too. If the food appeals so much that you may miss it at home, you can also arrange daily cooking classes with the chef! The agriturismo is on the west coast of Sicily, the lesser known coast, quite a bit away from the major urban areas of the north and east. Therein lies its charm though, much of the west of Sicily has an isolated, almost other worldly feel to it, and the coastline can be spectacular. The one place that visitors will generally make a beeline for in the west is the so called Valley of Temples, i.e. the ancient Greek temples and theatre at Agrigento, a very impressive UNESCO World Heritage Site, which is conveniently located just a few minutes away by car from Masseria Agnelo. There is also another UNESCO Heritage Site in the close surrounds; the white cliffs of the Scala dei Turchi, in the town of Realmente just a few kilometers away. And, yet another extraordinary sight in these parts is also just a few kilometers from the Masseria; the Salt Rock Mine with its underground Cathedral of Salt. It really has to be seen to be believed! You can arrange tours to all the above from the Masseria, as well as various activities like horse riding, mountain biking and boat trips around the beautiful coastline. There is also a concierge service for any little extras you may need. The nearest airport is Palermo International airport, about 150km away to the north, and shuttle services are available from there as well as from other locations.